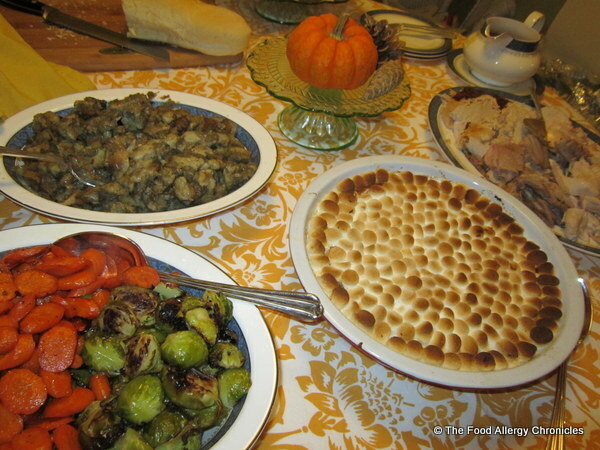 Posted on October 8, 2012 by Susan H.
This weekend our family celebrated two events…Thanksgiving and my husband’s 46th birthday! Unfortunately, planning when to celebrate the two posed a bit of a problem…our evenings clashed with the boys’ hockey games. Matthew had a game on Saturday night at 10 pm and Sunday at 6 pm while Michael and Andy have a game tonight at 8 pm. Our solution, Andy and I headed out Friday night for a romantic birthday dinner and enjoyed our Thanksgiving/family birthday dinner after Matthew’s hockey game on Sunday. Thanksgiving is all about giving thanks…First and foremost, I am thankful that my boys are healthy, I am thankful that despite their asthma they participate and enjoy many sports including house league hockey, I am thankful that through all the eczema, asthma and multiple food allergies, my boys are surrounded by good friends, are excelling in school, are physically active, work together on a paper route, actively seek volunteer opportunities, and through it all, seem to exhibit a positive attitude towards life. For that I am forever grateful. I can tell you…this journey has been worth ever second…I am so proud of my boys! I am also very thankful for all the wonderful support from friends, family and the staff at my boys’ schools. Journey’s like ours need all the guidance, love and understanding one can give! As our journey is an ongoing one…please remember how dear you all are to us! 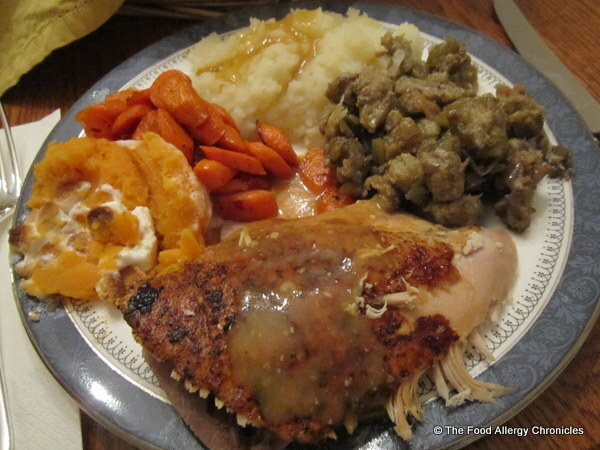 Our Sunday Thanksgiving Allergy Friendly Dinner was very similar to last year…Dairy Free Roast Turkey, Dairy, Egg, Soy and Peanut/Tree Nut Free Stuffing, Dairy Free Gravy, Dairy Free Garlic Mashed Potatoes and Dairy, Egg, Soy and Peanut/Tree Nut Free French Stick. Click here to view. Veggies this year consisted of my favourite Maple Roasted Brussel Sprouts and the boys favourite, Maple Roasted Carrots. 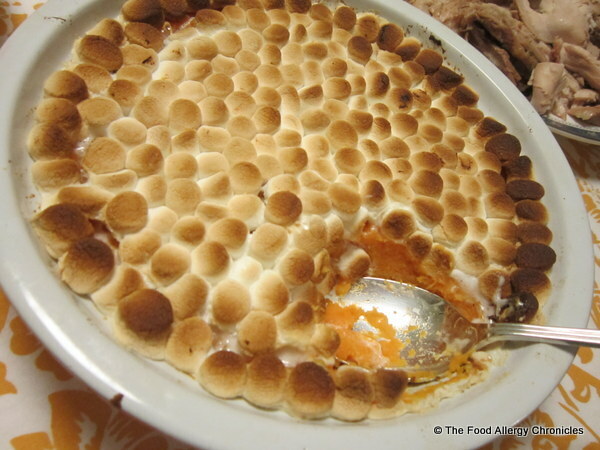 We even tried out a new recipe from The Toronto Star…Marshmallow Sweet Potatoes. I just replaced the butter with olive oil to make it dairy free. Click here for the recipe. The boys spent the afternoon with their father at their cousin’s hockey tournament…his team won all their games and the overall tournament! Way to go John! 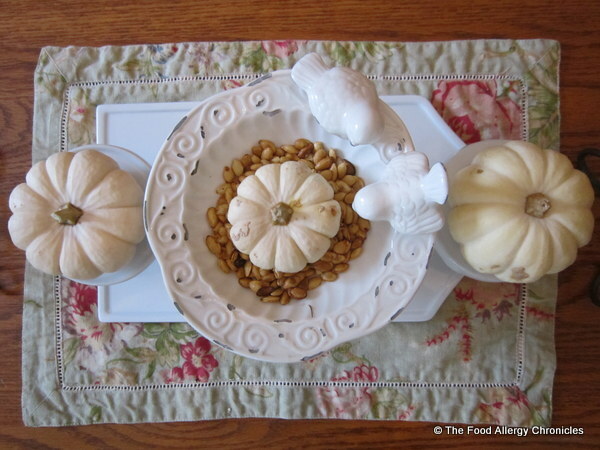 I spent the afternoon prepping and preparing our Thanksgiving feast! I really wanted to attend Matthew’s 6pm hockey game…so I prepped the veggies so they would be ready to roast when I got home, prepared the stock for the gravy, and whipped up the Dairy Free Garlic Mashed Potatoes….Michael perfected them when we got home. It truly was quite the feast…Michael enjoyed this plateful! For dessert…Michael is truly thankful that my in-laws gave us so many Spartan Apples from an Apple Fest they attended last weekend. My mother-in-law also surprised me with some beautiful apple placemats as seen under the apples above and under the Dairy, Egg, Soy and Peanut/Tree Nut Free Apple Kuchen below. Michael could hardly wait for me to bake one of his favourite apple desserts…Dairy, Egg, Soy and Peanut/Tree Nut Free Apple Kuchen. Luckily, it is also one of the birthday boy’s favourites too! Dairy, Egg, Soy and Peanut/Tree Nut Free Apple Kuchen was inspired from one of my all-time favourite desserts as a child. Not quite sure where my mom acquired this recipe but I know I am also very thankful for it. I just make Michael’s favourite Dairy, Egg, Soy and Peanut/Tree Nut Free Vanilla Cupcake batter, top with sliced local apples, sprinkle with a sweet brown sugar crumble and bake. 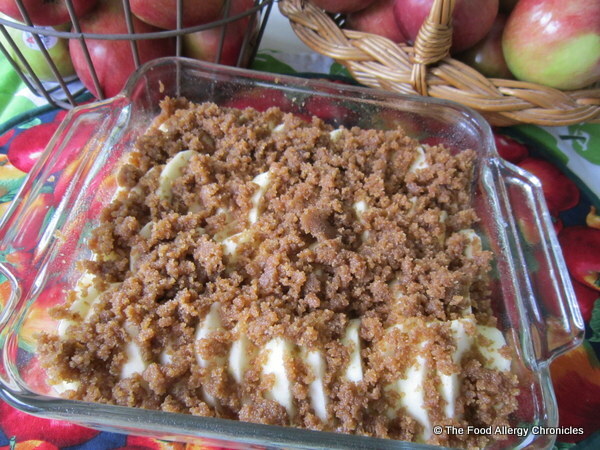 Moist vanilla cake topped with a marriage of tart and sweet from the apples and crumble… yummmmmmmmy! In a large bowl, measure and mix together all the dry ingredients. In a smaller bowl, measure and mix together all the wet ingredients. Add wet to dry and stir to combine…do not overmix. Pour into a 8 by 8 inch glass dish that has been sprayed with canola oil. In a small bowl, combine all the ingredients for the crumble…sometimes it is best to just get in there with your fingers to create a good crumble mixture. Arrange apple slices over the cake base. Let cool on cooling rack…best eaten when still warm. Tip 1: To double the recipe, double all ingredients except for the baking soda…keep it at 1/2 tsp and add 1/4 cup of applesauce along with the wet ingredients. Tip 2: Delicious the next day reheated! 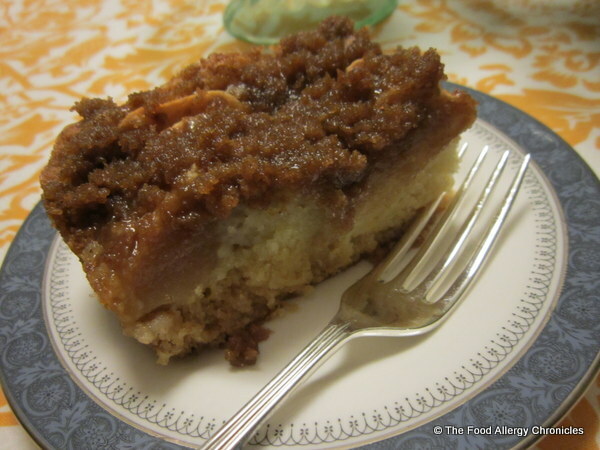 This entry was posted in baking, cakes, dairy free, dessert, egg free, multiple food allergies, peanut/tree nut free, sesame free, soy free and tagged allergy friendly apple cake, apple season, Dairy Egg Soy and Peanut/Tree Nut Free Apple Kuchen by Susan H.. Bookmark the permalink. Thank you! Looking forward to leftovers tonight…the boys already dipped into the turkey at lunch! Enjoying this beautiful fall day…hope you are too! Enjoy your thanksgiving feast with your family. Happy thanksgiving to you. 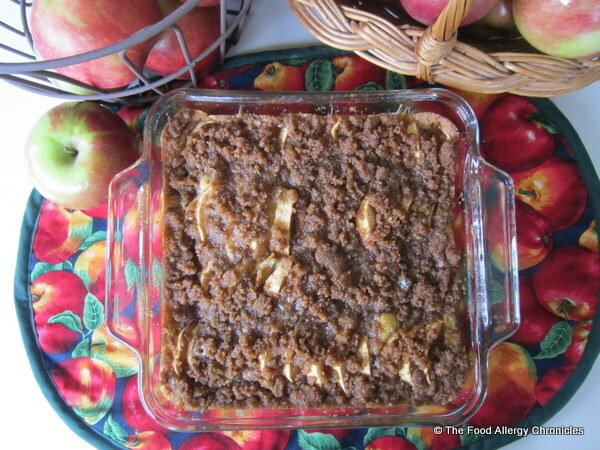 I made your apple kunchen for our thanksgiving dinner and everyone loved it. Most could not believe it was free of my daughters allergens. Thank you for all that you do. This looks delicious! 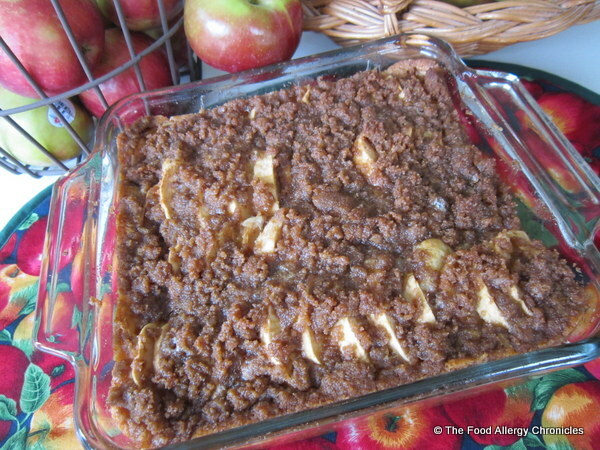 I can’t wait to make the Apple Kuchen this weekend. Thanks for sharing! Thank you! 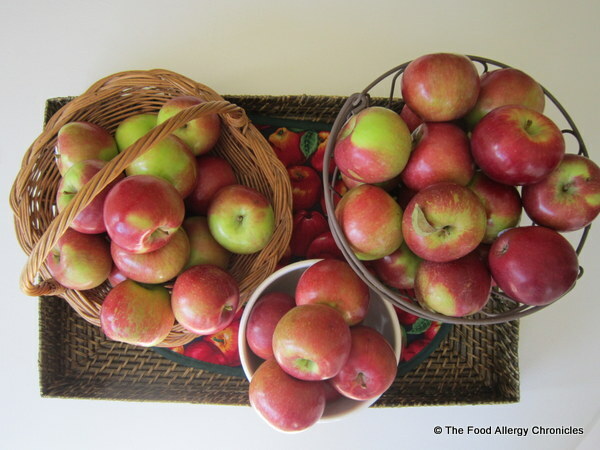 Perfect cake for apple season…hope your family enjoys it as much as mine do!